This began as a study in shading. I drew two circles, and (curved) tangents that met at two separate vanishing points. I intended these two triangular constructions to be the sources of light for each of the circles. I shaded the first circle beginning with dark on the outside gradually becoming white in the center; the other I shaded with dark in the center and white on the perimeter. I changed the function the triangular shapes and, as with the circles, I shaded them to resemble cones: one with a dark center line, turning lighter toward the edge; the other with darker edges. I let the composition rest and, when I returned to it, the idea of two eyes came to mind. I finished the composition by completing the wiring of the eyeballs to the brain. The main bundle of the optic nerve targeted the visual cortex on the opposite side of the brain and a small portion headed to the cortex on the same side of the brain. I get a bit anxious when I don’t have a clear idea of a composition in mind before I start painting. However, when the early stages of a painting suggest the next visual elements to include, I gain a sense of calm, and accomplishment. 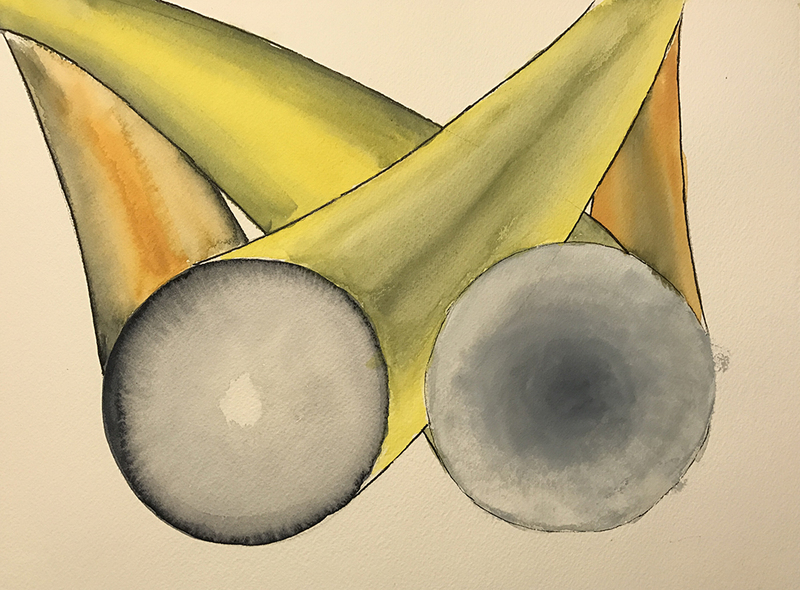 This entry was posted in Personal Stories and tagged abstract art, abstract expressionism, art, artistic process, creative process, creativity, shading, visual arts, visual elements, watercolor. Bookmark the permalink. I try, Kerfe. Sometimes I don’t have an idea in my head. Then it’s very tough. My problem is too many ideas. Both sides can be equally paralyzing I think.